So you have done your homework and you have decided that a Ninja NJ600 blender, which features 1100 watts, a 72 oz pitcher, and 3 speeds, is just what you need in your kitchen to make delicious smoothies and help you with prep work. The next step is to make a purchase plan, including finding the best deal and budgeting. Everyone loves a deal and the cost for a Ninja NJ600 blender can range from $121.96 to $88.96, according to Consumer Reports, depending on where and when you make your purchase. It will certainly pay to be diligent in your research for the best price. For example, Mother’s Day is a perfect time to find a great deal on the Ninja NJ600. In May, both Macy’s and Best Buy are offering coupon codes — Macy’s discount includes 20 percent off all blenders with an additional 10 percent off at checkout with the code and customers at Best Buy can save $20 with the coupon code, MOTHERSDAY20. Those that don’t need to buy their Ninja NJ600 right away can also consider waiting for the biggest sale days of the year, like Black Friday. In 2013, Macy’s sold the blender for $83.99 and sears for $99.99 and Amazon for $89.99. Another option is to purchase a reconditioned Ninja NJ600. While not brand-new, Sears, this month, is offering the blender for $69.00, down from its regular selling price of $119. If you are planning to get married in the next year, placing a Ninja NJ600 blender on your registry is a smart decision. For starters, the blender is available at most all retail stores, including Macy’s, Sears, K-Mart, Walmart, Bed Bath & Beyond and Best Buy, so no matter where your registry is, you will be able to add it. You also won’t need to worry about your NJ600 disappearing off the shelves; blenders are not similar to electronics where the technology changes from day to day. And if you aren’t tying the knot anytime soon, you may also want to consider adding it to your holiday wish list — relatives and friends will be happy to purchase a gift that they know you want. If you not planning on asking for a Ninja NJ600 and will be making the purchase on your own, budgeting for the kitchen appliance, which will run you about $100 on sale or not, is a good idea. Setting a goal to sock away a few dollars, each week, is a great way to start. For example, if you put aside $20 a week, you will be able to purchase your blender in 5 weeks. If you have less to work with, decrease your savings rate to $10 a week and make your purchase in 10 weeks. While some may laugh, saving change in a jar is another way to put away for money for your blender. Many are surprised at how fast loose change ads up. 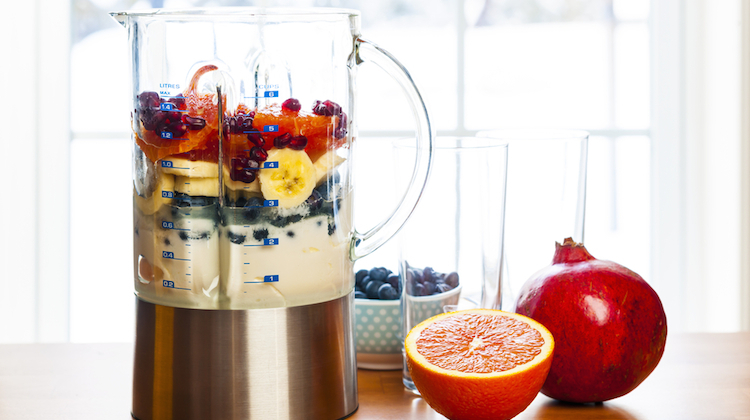 Blender smoothie image courtesy of Shutterstock.